The youth wing of the Gorkha Janmukti Morcha today said it will hold a mass rally on June 2 to push for the demand of granting Scheduled Tribe status to the 11 communities of the Darjeeling hills and the plains of Siliguri. Gurung, Mangar, Newar, Jogi, Khas, Rai, Sunwar, Thami, Yakha (Dewan) and the plains community is the Dhimal. The Morcha got a boost to its demand after Prime Minister Narendra Modi endorsed it during an election campaign for party candidates in the north Bengal region recently. Earlier this year a committee was also formed by the Union Ministry of Tribal Affairs to examine and make recommendations. “The PM has given a positive response to our demand. A committee has also been formed by the central government. It must be remembered that we are demanding for ST status and therefore, we must take proactive steps to pursue the issue,” said Sanjeev Lama, the GJYM general secretary, today. 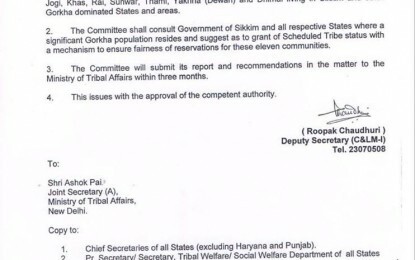 The state government too had recommended the inclusion of the 10 hill communities under the tribal status category. 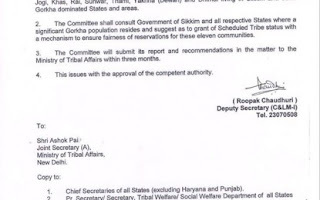 At present, the Bhutia, Sherpa, Yolmo, Lepcha and Tamang come under the Scheduled Tribe status. The Bharatiya Gorkha Janjati Sangarsha Mahasangh (BGJSM), an umbrella organisation of the communities demanding tribal status, too has been pursuing the issue with the central government. After the Centre’s initial nod to look into the issue, the Mahasangh has started a mass signature campaign to garner support and make people aware of the demand.